The name is given so because of its origin from Chainpure village and its purpose for decoration. Although it is usable, it is used as a decorative tool that represents the true craftsmanship of Chainpure. The scabbard is skillfully crafted with Indian rosewood case and brass fittings are wrapped around to give a handsome look and from protection. It is simple yet very attractive. 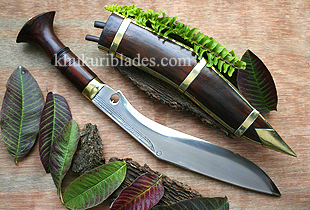 The blade is same as the Chainpure Leather Kukri which is fully functional. A hole like notch is always there to symbolize where it is made and to use it as a tool and not as a weapon.